Stocks & Economy Still In Trouble; Lower For Stocks? Does a Contracting Economy Mean Stocks are in Trouble? was my last article dated May 31, 2011. In that article I stated, “I do believe the sharp sell-off we witnessed in commodities a few weeks back is a preview of what is to come in the stock market...I think the stock market is set-up nicely for some meaningful corrective action” and “What some people call an economic recovery I really call a controlled recession or maybe even a controlled depression.” It would appear those assessments were correct. So what am I looking for now? I still believe the economy is in trouble and the stock market also has more meaningful downside. There are far too many worldwide and domestic problems that still are not resolved and do not appear to be anytime soon, even though you hear a lot of rhetoric as to how they will be addressed. On September 7, Germany’s top court will give its verdict on whether the government broke the law with last year’s bailouts of debt-stricken EU countries. If we see an unfavorable verdict, it could spell significant trouble for stocks. European banks have a liquidity and solvency problem. If one goes under, does anybody really know the contagion effect? Could this develop into 2008-Lehman Brothers all over again? This is a real conundrum because European banks are too big to fail but they might have to. Some European countries challenged with debt are too big to bail out but can you really let them fail? Again, another conundrum but some countries may have no choice but to fail. There are over 800 FDIC-insured institutions nationwide on the FDIC's problem bank list, representing approximately 12 percent of all FDIC-insured institutions. How many of these will fail and what might be the repercussions on the domestic economy? Also, I should note, we have plenty of undercapitalized institutions as well. Canadian banks may not have the debt & real estate issues but may have ties to UK and EU banks that exposes them to unknown degrees. What further contagion impacts might this have if UK or EU banks blow up? The Federal Reserve Bank of NY has been funding off-shore banks in Europe and recently lent $217 million to the Swiss National Bank a few weeks ago. Might this suggest that there is a potential liquidity or solvency event ready to take place in the EU soon? Credit Default Swaps have soared to pre-Lehman levels in some cases. By seeing this, one must realize we are nowhere near the end of this crisis or even out-of-the woods. As of recent times, there has been a shift in the CMBS (Commercial Mortgage-Backed Securities market); as REIT's and players are reportedly backing-away from overpriced properties in major cities now. These are some very savvy institutional players; I believe this warrants very close paying attention to. There are still plenty of derivative risk along with state and municipality defaults being possible. This is something that is on the back burner but any blow-ups here, could deal a severe blow to the economy and the stock market. On August 19, Moody’s said insurance companies could be at risk if low interest rates persisted for an extended period of time due to low returns and the impact based on actuarial tables. How might a downgrade of insurance companies be felt? This certainly would be an unintended consequence of the Federal Reserve keeping rates low for an extended period of time. I don't believe the fundamental problems facing us are going away anytime soon due to the sheer number and level of interconnectivity present in our global financial system. Because of this, the world economies are being downgraded, thusly downgrading living standards for most, whether people like it or not. There is not really much that can be done about it because of the debt structure. That is why what I have called this economy a controlled Recession/Depression, which carries real societal risks. With all the economic problems we currently have, I find it amazing that Congress wants to investigate S&P Rating Service because of wrongdoing in the housing debacle. Perhaps, they really want to go after them because they want to shoot the messenger of what today's reality holds. A reality I believe one could have foreseen, since it was really a straight forward assessment that Keynesian economics would be applied by the Fed, and it would not work, given our huge debtor status. Besides, the funds were largely misdirected making matters even worse. The real problem is Washington D.C., they like playing the blame game for their own inadequacies and mistakes they have made and are more worried about their political careers. What they should be focused on is making real structural changes in policy that will create jobs. Even if/when they make these changes, it will take time for a recovery since they have delayed them for so long. It will be interesting to hear what President Obama has to say in his speech after Labor Day. It certainly would appear as though we are in a largely structural (financially based) bear market. To that end, I believe we will see a structural revaluation of stocks. This is why I believe the S&P 500 lows of 1101 will not hold and will be broken in the fullness of time; and eventually 950-1050 may not even hold. I beg to question, “Why can't we see multiples as low as we did in the 1960's or 1970's?” After all, our growth rate and employment is worse now. In a slower/no growth period of time, the market should place a lower valuation on earnings, irrespective of earnings holding up or even improving. Also, I should note, Goldman Sachs recently lowered their S&P 500 earnings outlook for 2012 to $75-$90. 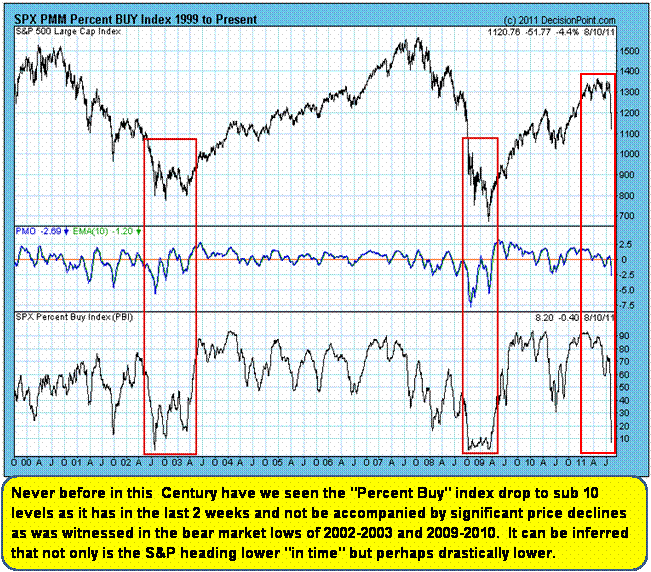 There are plenty of other reasons I can point to as why stocks should move lower but I find this chart below very compelling; that being the Percent Buy Index. The proportion of “selling over buying” equals what was seen at the lows of basically full-blown crashes in the past, but this time around we have not seen the large price declines, as of yet. I believe it is pretty scary in that many technicians think the stock market has already fallen off a cliff. I think both, point to plenty of more downside to come. The bulls will claim this proves we are at a bottom and there is no 2008-type risk to further panic the market. On the other hand, the bears will point to this and say stocks have significantly more downside; I concur with the bears. However, I do realize that whatever low we might experience in the September/October timeframe will more than likely be the low for the remainder of the year since seasonality will favor upside in November/December. Also, it is worth noting that even though we have a lot of issues to contend with, it sure does not appear as though Wall Street minds poor economic data because to them, it means QE 3 (Quantitative Easing) is on the way, which in turn means higher stock prices if we judge the impacts from QE 2. We should continue to see a volatile economy and stock market for the foreseeable future. Just remember that a sensitive market is one built on a “house of cards” and with the advent of HFT (High Frequency Trading), this makes for any downside or crash to be potentially more exacerbated. Irrespective of what President Obama says next week, I believe there is no bullish outlook on the economy in the immediate future. As for the stock market, I believe risk comes back into play in a significant way after Labor Day and I do believe the months of September and October, which are some of the worst months for stocks, will play out accordingly. I believe 950-1050 is a very realistic downside objective in the fullness of time (not necessarily in 2011) and, at this point, I am not discounting even lower prices if we see a “BLACK SWAN” event. And incidentally, you get emotional over-runs in a 'crash' or capitulation, something I will not rule out. If the stock market goes into a true free-fall state, I will let the messages of the market tell me where and when it is really trying to establish a low point. I do believe America will work through this but I think we must first endure more pain in both the stock market and economy.